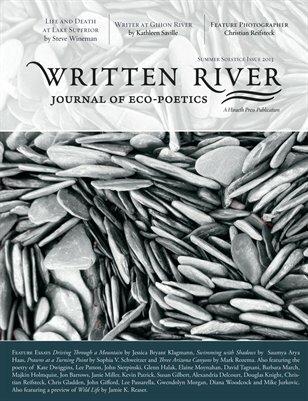 The summer sol­stice issue of Written River: A Journal of Eco-​​Poetics in now avail­able! Read the free e-​​edition below or visit our Magcloud Store to pur­chase a print copy to savor. Feature Essays in this issue include: Life and Death at Lake Superior by Steven Wineman, Writer at Gihon River by Kathleen Saville, Driving Through a Mountain by Jessica Bryant Klagmann, Swimming with Shadows by Saumya Arya Haas, Prawns at a Turning Point by Sophia V. Schweitzer and Three Arizona Canyons by Mark Rozema. The issue also fea­tures the poetry of Kate Dwiggins, Lee Patton, John Sierpinski, Glenn Halak, Elaine Moynahan, David Tagnani, Barbara March, Majkin Holmquist, Jon Barrows, Janie Miller, Kevin Patrick, Susan Gilbert, Alexandria Delcourt, Douglas Knight, Chris Gladden, John Gifford, Lee Passarella, Gwendolyn Morgan, Diana Woodcock and Mike Jurkovic. Finally, we included a pre­view of the much-​​anticipated Wild Life by Jamie K. Reaser. The fea­ture pho­tog­ra­pher for the issue is Christian Reifsteck.